Originally published under the title "A Bounty on My Head, I'm a Virtual Prisoner in Delhi." Tarek Fatah at an Urdu poetry and literature festival earlier this month. For the past few weeks I have been a virtual prisoner inside my Delhi Hotel, unable to walk out or attend any public event unless accompanied by "security." Threats by Islamic clerics that I had initially shrugged off as false bravado have turned out to be serious after one cleric pronounced on my TV show that I was a "kafir" (unbeliever), making me an apostate from Islam that, under some interpretations of sharia law, allows any Muslim to kill me, as stated unambiguously by a Canadian Islamic cleric. A week earlier, another Islamic cleric from Kolkata, while addressing me on a live, televised debate, boasted, "you will soon be beheaded." Then, on Sunday, I was attacked by a mob of nearly 100 Islamist extremists at a culture festival ostensibly celebrating Urdu poetry and literature. Islamist bullies threaten violence and then act as if Islamophobia is the problem. Other progressive writers of Muslim background have faced such threats and quite justifiably left India. I chose to stand my ground because I feel it is worth the risk to stand up to Islamist bullies, who threaten violence and then act as if Islamophobia is the problem and not Islamofascism. I woke up Tuesday morning to read the Times of India reporting that an Islamic cleric had put a bounty on my head as well as that of Dr. Subhas Chandra, the head of India's leading TV news network, Zee News. Turns out my hosting of a TV talk show on Dr. Chandra's network on Saturday nights during prime time has made me a popular household name and a sought-after celebrity, of sorts. 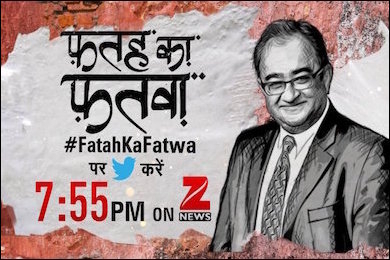 The show is an all-Muslim, no-hold-barred discussion forum called "Fatah Ka Fatwa" (Fatah's Fatwa). 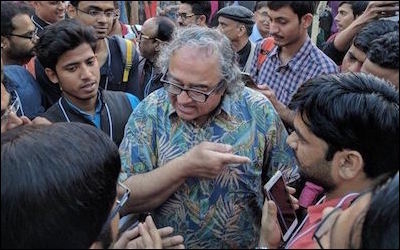 Tarek Fatah's TV talk show has made him a celebrity – and a lightning rod for controversy – in India. On it, we grapple with issues that for centuries have never been fully discussed openly in public, outside the confines of Muslim homes. These include polygamy, child marriage, the institution of Muta'a (a temporary marriage that provides a theological cover for prostitution) and contempt for "kafirs," meaning non-Muslims. Many Muslims, primarily loyal to the Islamic Ummah rather than to their country of citizenship, came pouring out to protest. A petition was filed in the Delhi High Court to halt the show while the country's broadcasting authority was asked by some Islamic clerics to intervene, but to no avail. They had reckoned they could scare me, but I had called their bluff and all they could do now was threaten me on the show and even shower insults on my daughter. After all their legal attempts failed, it seems the mullahs have decided to try to do what they do best, browbeat and physically bully me, a secular, liberal Muslim, into silence. As I contemplate several death threats and the bounty placed on my head, I can't help but wonder about Motion 103, now before our [Canada's] House of Commons, wherein Mississauga Liberal MP Iqra Khalid would have us believe, the real threat to our communities is "Islamophobia" — not Islamic radicals hell bent on killing in the name of Islam. Then there was this gem from a Canadian Muslim who wrote in the Toronto Star that Islamic sharia "may be the best tool we have to counter the violent and anti-modern narratives of (Islamic) extremists."